How does this happen, this exquisite detail, these fine drawings made by receding waters? 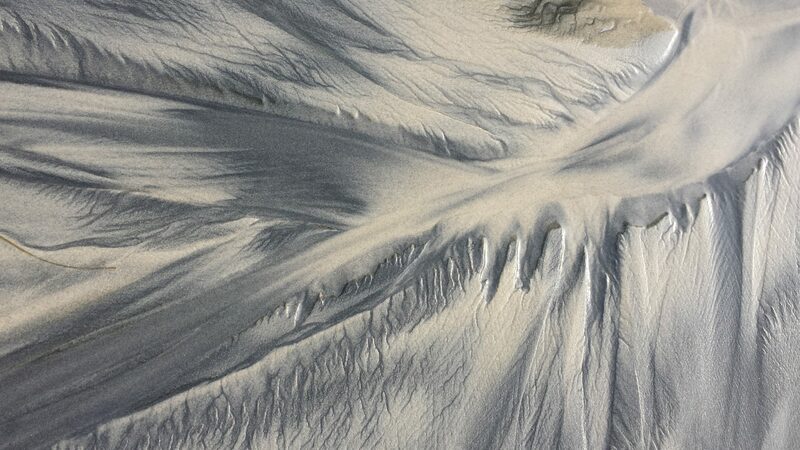 The elegance and clarity of the black deposits, their fractal nature, the repetition along a length of sand, the texture and depth — all amazing. There are hundreds, perhaps thousands of such drawings traced by the tides on these beaches, to be seen at any moment. I’ve never seen them at the Maine or Cape Cod beaches I’ve been to — perhaps they are there but I hadn’t noticed? Is it magnetic sand, the fine black stuff, or just darker powder eroded from the black stones? These drawings form around the kelp, around stones, around shells, and, I’ve recently noticed, around footprints. When there is something that interrupts the receding wave, it leaves its marks as if in protest or in exclamation. The next wave to come may blur or intensify the pattern; I should check to see which is the case, or it could even be that it does both/either, depending. Depending on what? What would we do without the idea and the word “depending?” Certainty is unsure, I’m sure. Maybe?